Could it be that the habits you develop today determine the life you live tomorrow? As project managers, we make endless choices throughout the day--how to use our time, how to interact with stakeholders, how to solve a problem. Our guest for this episode is Gretchen Rubin, who suggests that developing effective habits is a key responsibility for those who want to build a successful tomorrow. 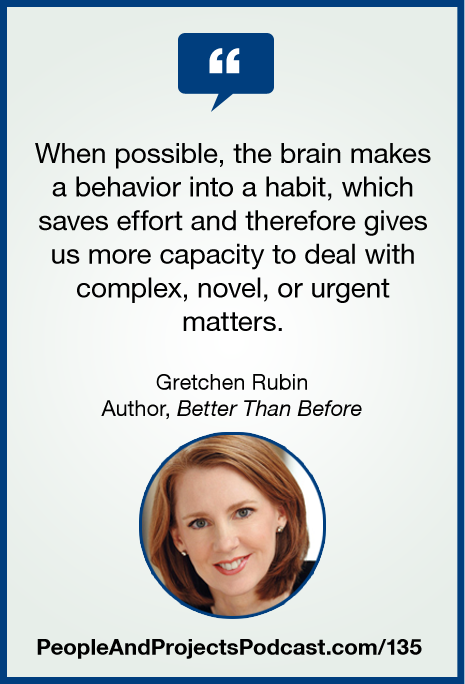 Gretchen is the author of a new book entitled Better Than Before: Mastering the Habits of Our Everyday Lives. To learn more about Gretchen and her book, visit http://www.GretchenRubin.com.